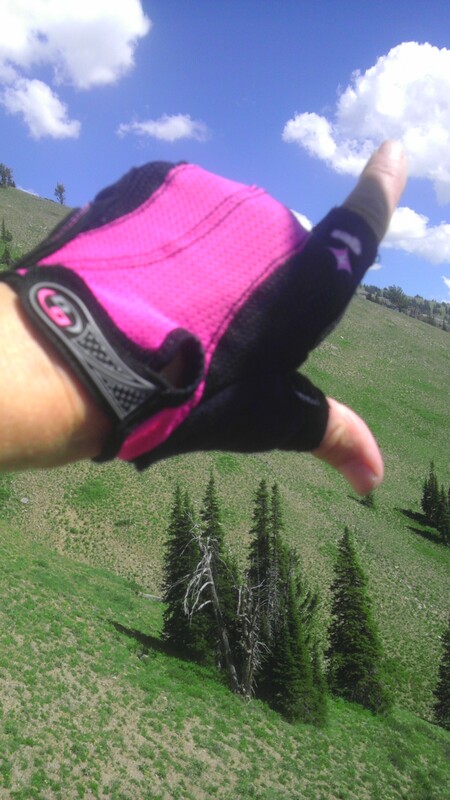 I still fell over and down more than anyone else on the trails, but I liked my gals ride I choose. It was fun to be among giggling ladies, especially when we came upon another set of stranded females with a flat. It took 10 of us 20 minutes to fix that flat! So girl. I think we were purposely enjoying the break. You definitely couldn’t help, but enjoy the views. My cardio taps so fast when I hit a hill. I breathe like a horse. I am beginning to wonder if the bout with Pneumonia years ago got a part of my lungs. I am still under acclimated. But riding bikes is a fun break from running. And I can’t, but think this will help build strength and endurance for running. 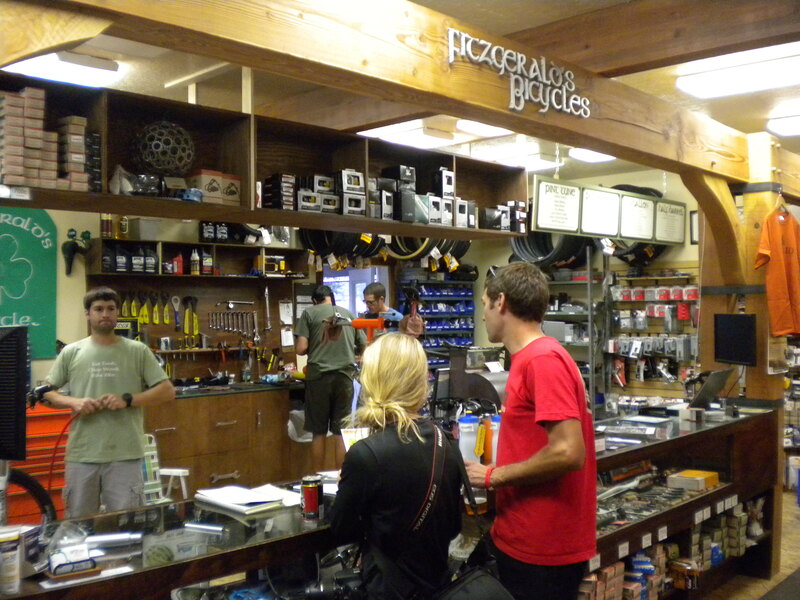 Yeah, for the vision of these bike shops to establish themselves at the front door to so much mountain biking. It was worth wydahoing?! 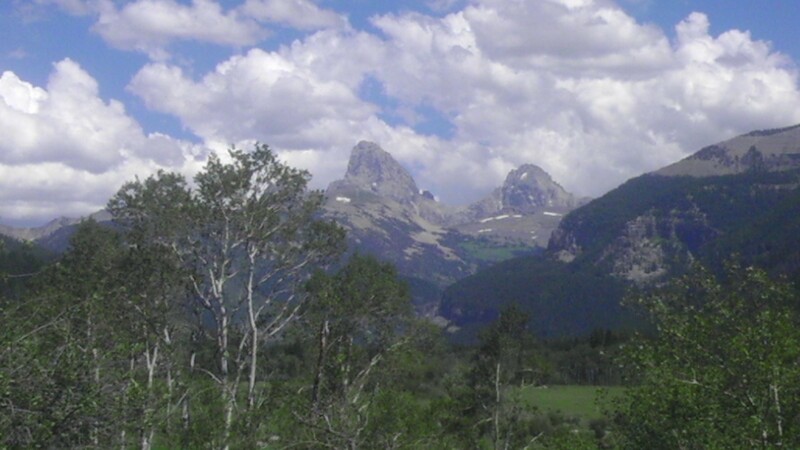 The back side view of the Tetons was almost more thrilling that the front because it was unexpected. 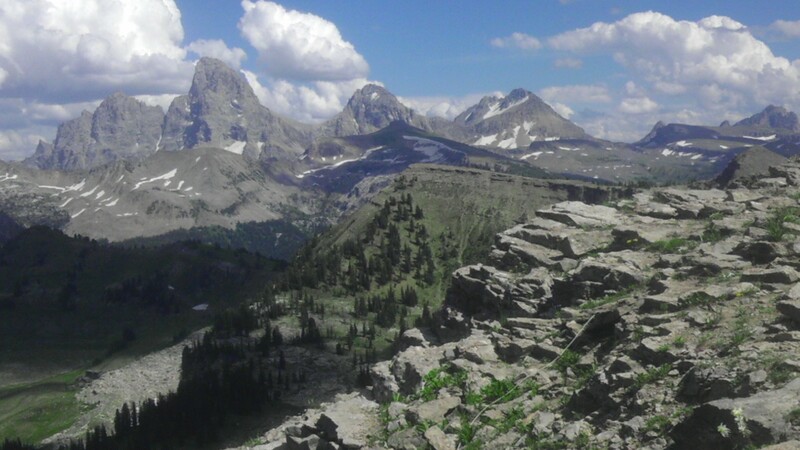 The grassy canyon that leads up to Targhee Ski area opened, and there it was, the Grand and the cluster of Teton peaks. You lose the view at the base of the lift, but the wild flowers, and green grass, and pristine ski resort are a view in themselves. 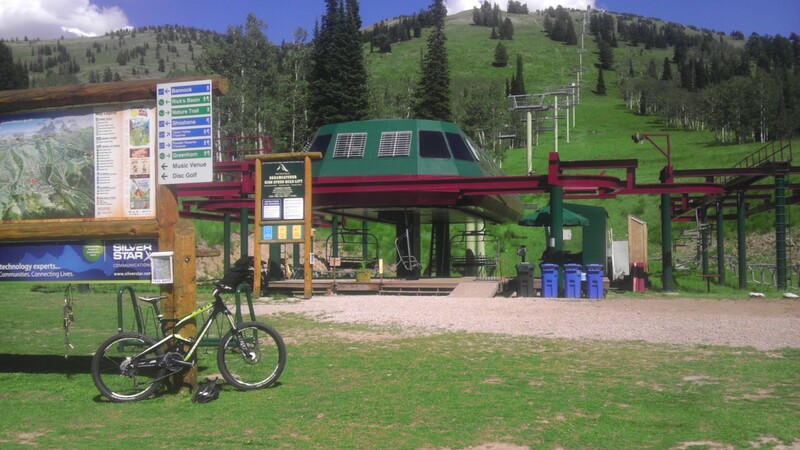 For $10, the lift takes you and your bike to the top. The guy handing me the ticket, held it out with a warning. “Somebody, just today, was taken off the mountain with a broken collar bone.” I hardly heard him. I was took excited to test drive Mud Bud. What a bright, sunny day. In my glee, I entertained my views by taking pictures of my gloved hands. They contrasted colors against the blue sky and green hills. Squeals buzzed from a bunch of girls getting on the lift…in high heels and dresses. I had to stay low and out of the photographer’s way on the top. 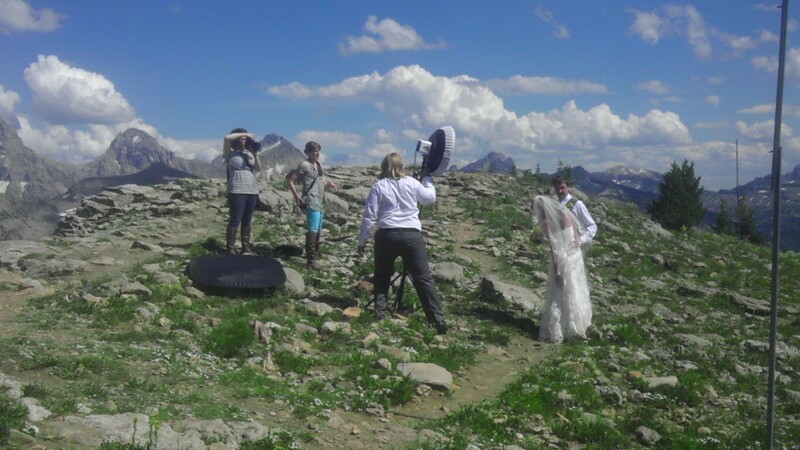 A couple was taking their vows with a wow of a backdrop. Good choice of locations. Great cooperation with the weather. 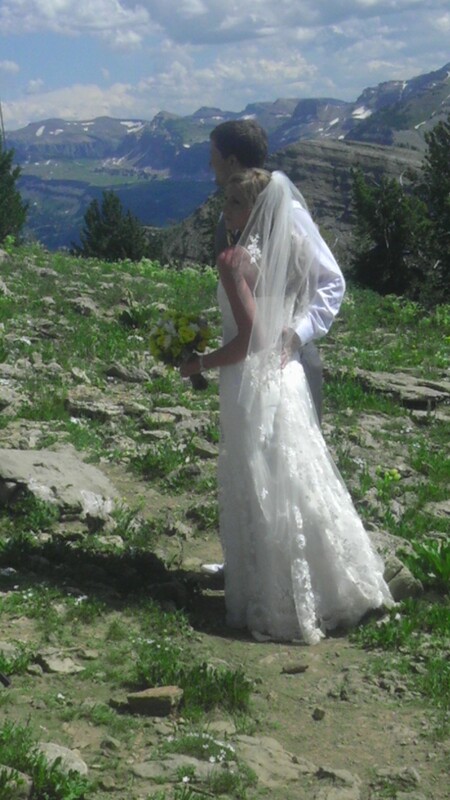 The wedding descended back on the lift and two very tattooed guys got off with their bikes. The attendant said he was going down and we would be the last ones on the mountain. The tatted guys ohhed and gooed over my bike as, me, the proud owner was able to puff out my chest. Then they got a concerned look across both their faces. “This bike has never been ridden.” I nodded. “Than what, the f… in tarnation are you doing up here?” I shrug. They shot looks at each other and in unison retorted, “How are you going to get down?” I stammered, “Follow you.” They adjusted my bike seat, gave me stern instructions on not to hold onto the brakes too tight. Tap each back and forth. “And when we get to this point on the trail that has a drop off, we will stop and let you look it over. 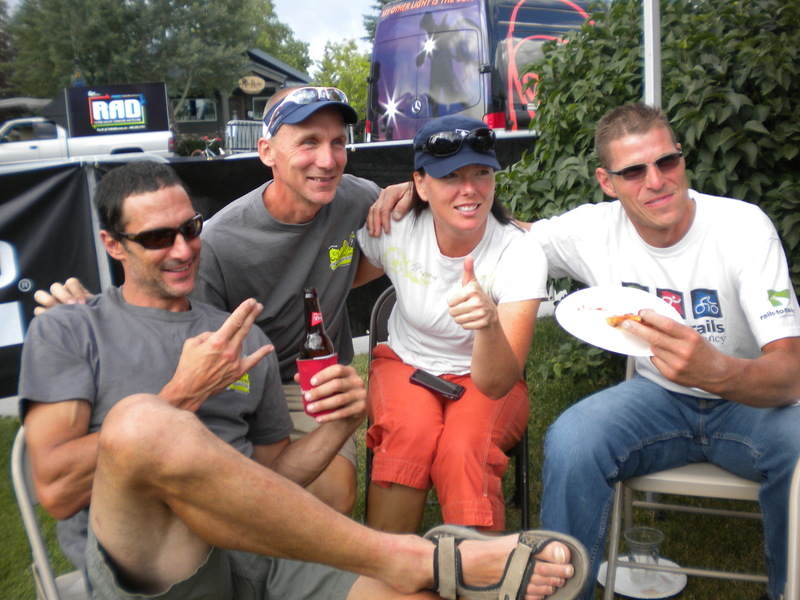 “ They both ran the local Dominoes Pizza chain and said they lived and breathed downhill Mountain biking. I was definitely about to breath it. It was terrifying. Rocks and roots and turns and trees. Even with the tap tap of the brakes, they were coming at me too fast. Bump. Bounce. I was so stunned that the bike took this terrain. Yeah, for the incredible bike built for just this. That’s when we stopped to look over the steepness of the next decent. And that is when I put my downhill foot down…on nothing. Soon I was rolling down the steepest part with my bike and one foot still clipped in to the pedal. Mistakes like this, I learned, equate to skin loss. Chunks of skin. We actually made it down in almost one piece. I didn’t get their names. But thank you guys for guiding me down. 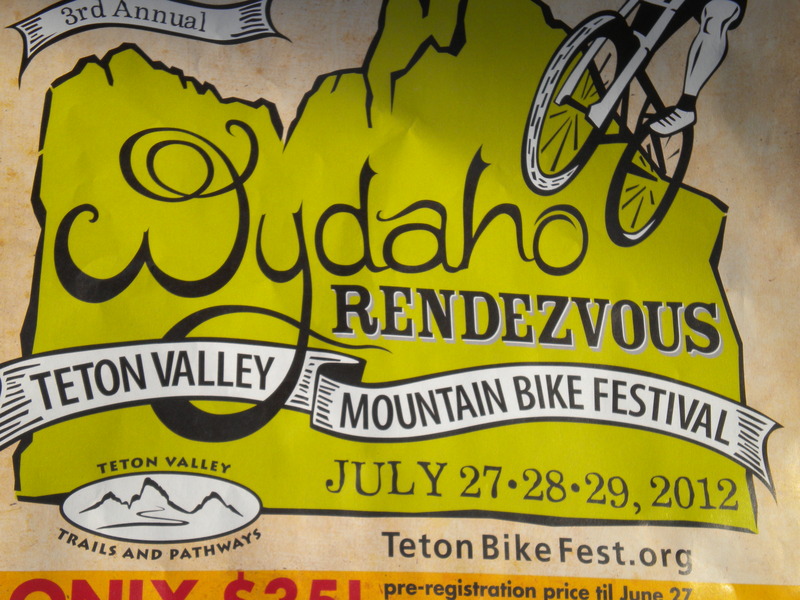 They suggested I attend WYDAHO. Meet Driggs, Idaho. 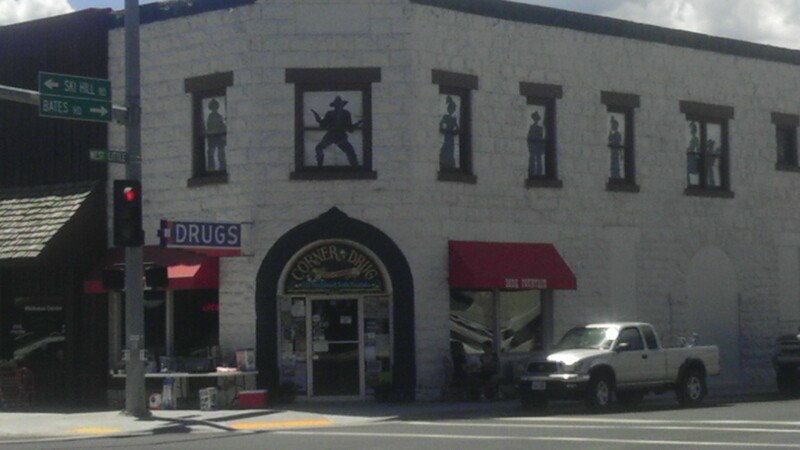 They have the wildest ,west-est looking street corner. 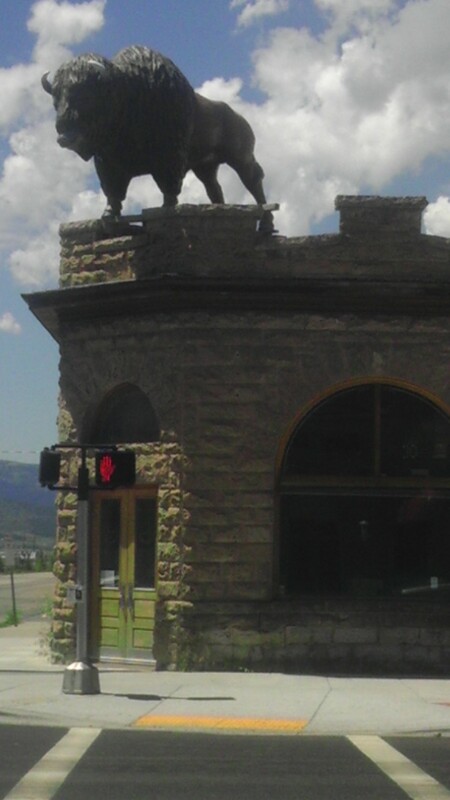 Where else could you find a buffalo perched on a building, or a real soda fountain parlor still in the drug store? 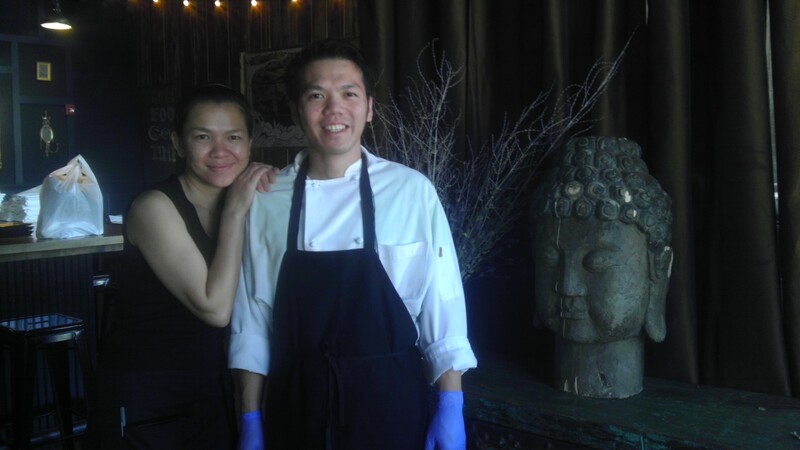 In the building where the Buffalo looms is, of all unlikely things, a Thai restaurant. 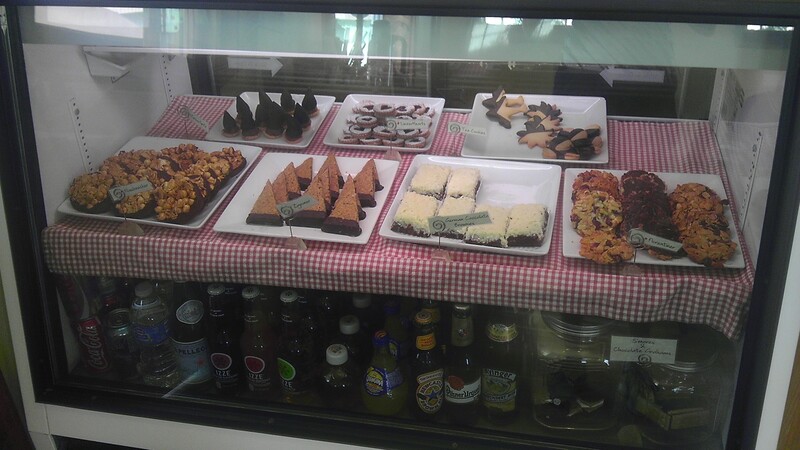 The inside of this building is worth stopping for. You would not expect it to be so richly renovated. I had the best Thai food I have ever tasted. And the best conversation about what it is like to come here from Thailand and make a go of it…in the wild west. Check out how nice and inviting the atmosphere is in this restaurant. I ferret marked it as a favorite. www.tetonthai.com/driggs_home.html. 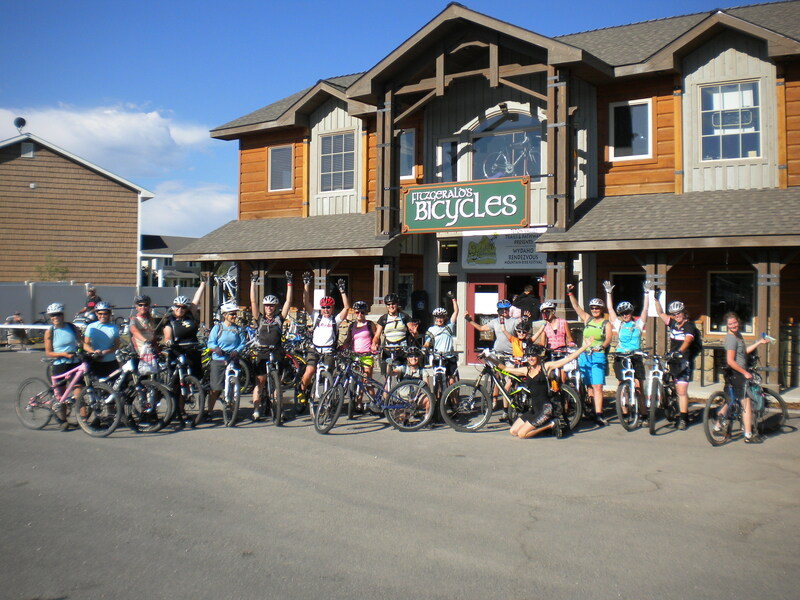 Sharing the building is a mountain bike/ skiing in winter, store called Habitat. www.ridehabitat.com/about. Hello, outdoorsy, helpful staff that were all about using the items they sell. They were willing to chat about places to mountain bike. I was itching to use my shiny, new mountain bike, remember the one I dubbed MUD BUD. They had maps and books and loads of trails and places. 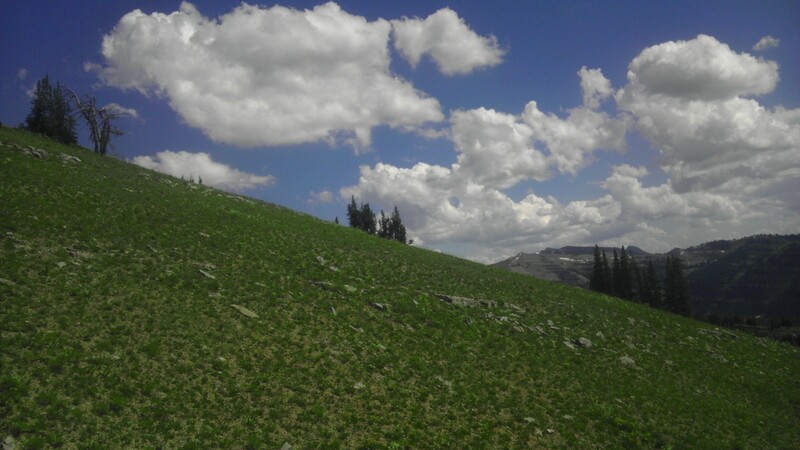 They told me to go up the road to Targhee Ski Area and start with the views it offered. But to, first, stop at Peaked Sports. It was yet, another mountain bike turns to skiing in the winter store. It was just one block up. They would have a book called the Wydaho, that would have single tracks and suggested routes they created in this region. Peaked Sports. That was on those singlets. 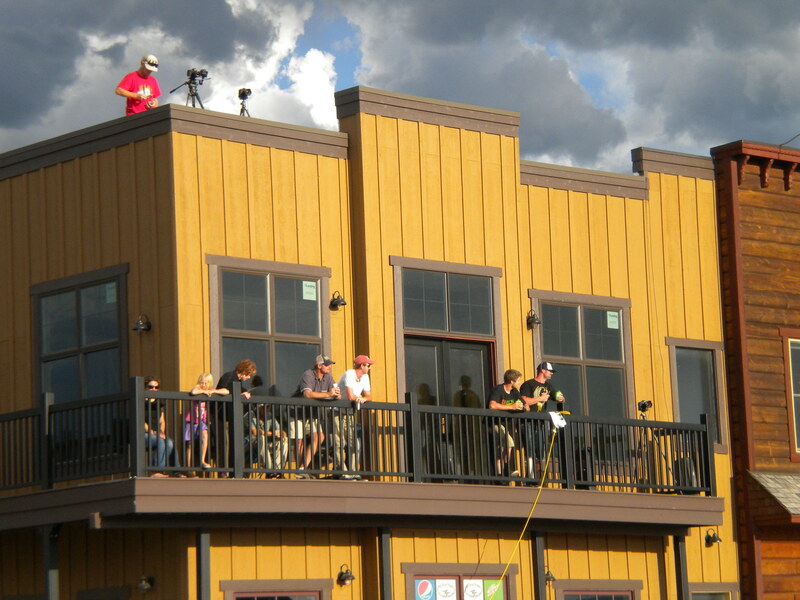 The owner of Peaked Sports had just put on the TIN CUP race. www.peakedsports.com/Home.html His crew was equally knowledgeable and helpful about biking. It was a huge store. They got me situated with a water bottle and told me to grab a coffee and a pastry from the best bakery around before leaving town. It was hidden behind the buffalo building, but worth the treasure hunt. Pendl’s Bakery (www.pendlspastries.com/index.php) Now, this is my kind of ferreting. A very satisfied tummy headed up Ski Lift Road. My sister was into animals, exotic animals. She had this pet ferret she asked us to babysit once. Even in its cage, it was in constant motion, racing around and rummaging through every corner. Its pacing generated effective sympathy and we would let it out. In instant thankfulness it would do what every cell in it was born to do. 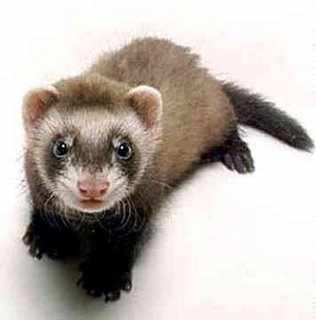 Ferret. The entertainment came as this tiny weasel rained havoc on a house; things spilling, ripping, knocking over as it buzzed through, under, into, and up on everything. I mean everything. And everything at once. That tiny tube of an animal could turn a house upside down in minutes, but it couldn’t help itself. It was pre-dispositioned to explore every nook and cranny. It had to search out and discover by poking into everything. It was its nature to do so. I am the ferret. I took some sunny days…weeks in the Jackson area to poke into as much as each day would adventure me. So much for slowing down! Just not one of my dial speeds. I know myself well enough to recognize my vacation and relaxation come through movement, not listlessness. I know those celled like me know what I am talking about. Our restless poking around drives many crazy, but I enjoy the activity of discovery. I almost can’t help it. I just have to see what is over that pass, down that trail, up that dirt road, on the tippy top of that pinnacle. Just have to. Sitting in a lounge chair or hanging in a hammock. Don’t see too many ferrets doing that do you? This is what I uncovered in the Jackson area. Let’s start with running. Most popular, trail running. 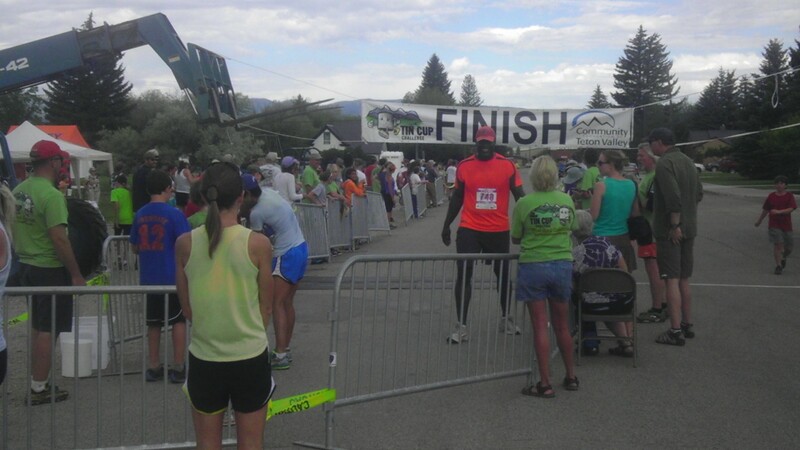 I timed the Cache Creek/Game Creek 20K put on by Teton Mountaineering the Saturday following the 4thof July. 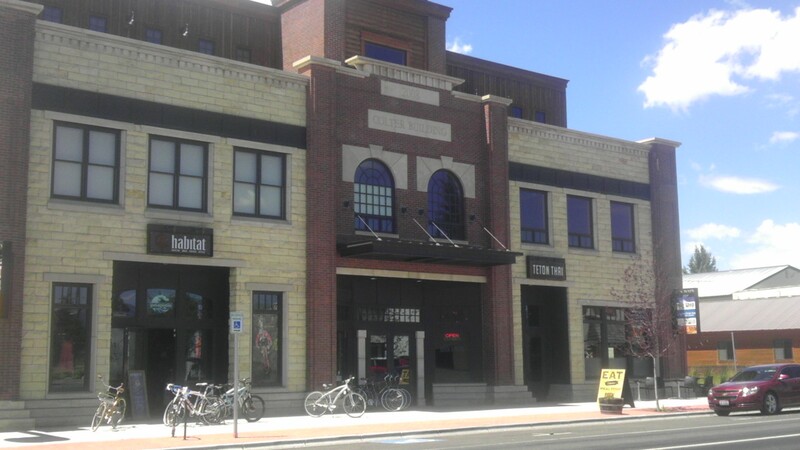 Teton Mountaineering is an outfitting store in downtown Jackson that sells high end products needed for clothing or gearing you for the outdoors. 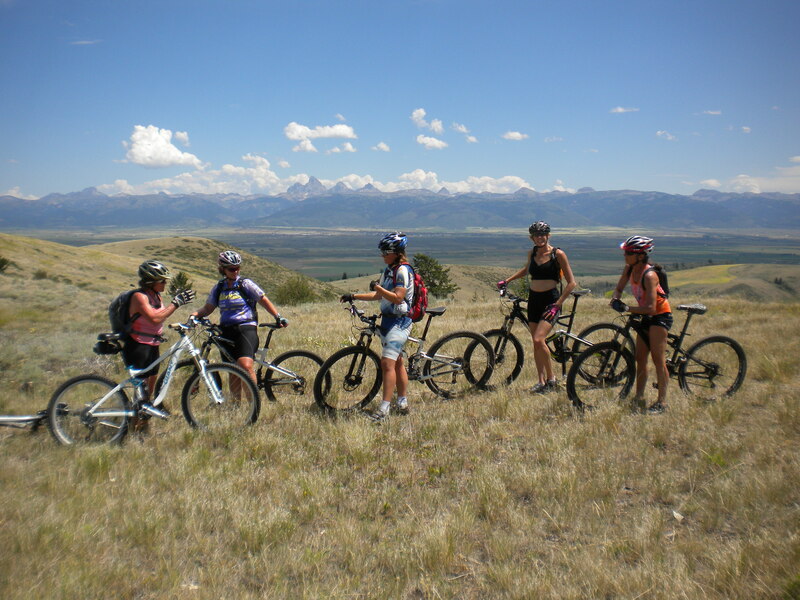 They are experts in this area and can provide advice on trails and equipment. 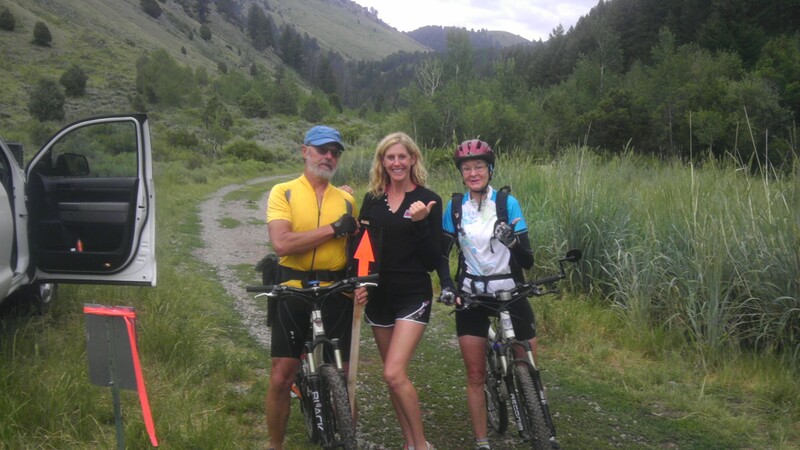 They love and respect the trails in the area, and keep a low key opportunity for avid trail runners to have an organized run up Cache Creek bordering Snow King Ski resort to the other side, called Game Creek. 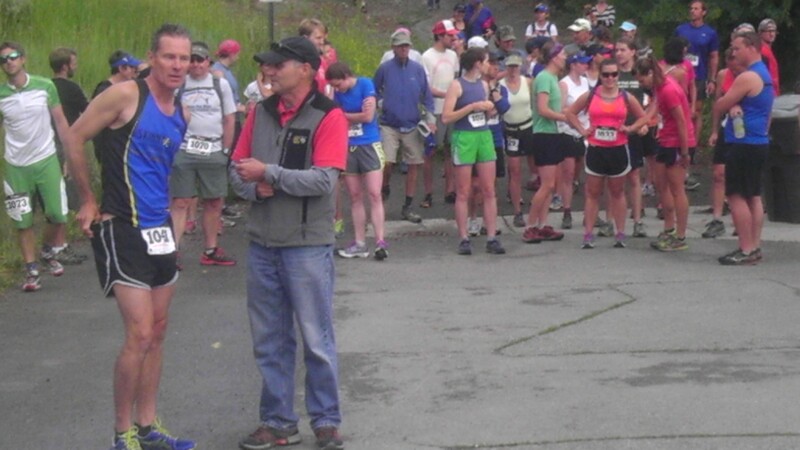 It is a point to point 11ish miler that gives participants aid stations on the course, product give aways, and a shuttle ride back to town. 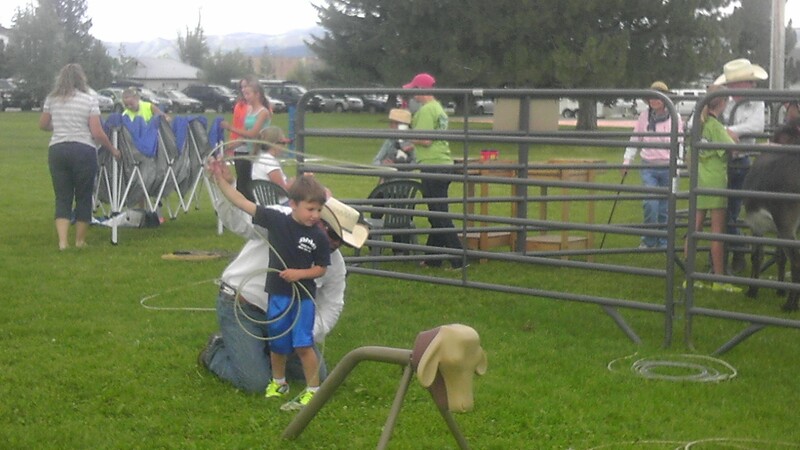 My son came up and was the computer operator so I could be the grunt in the chutes and get to know the locals. 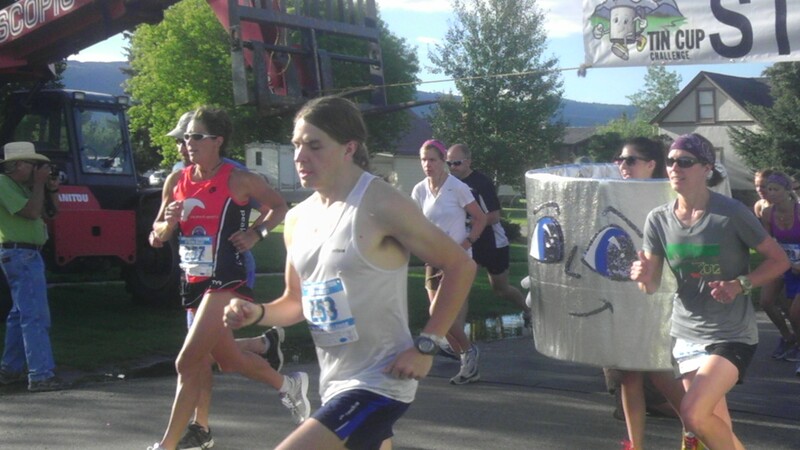 The runners churning down the trail to the finish were FIT. 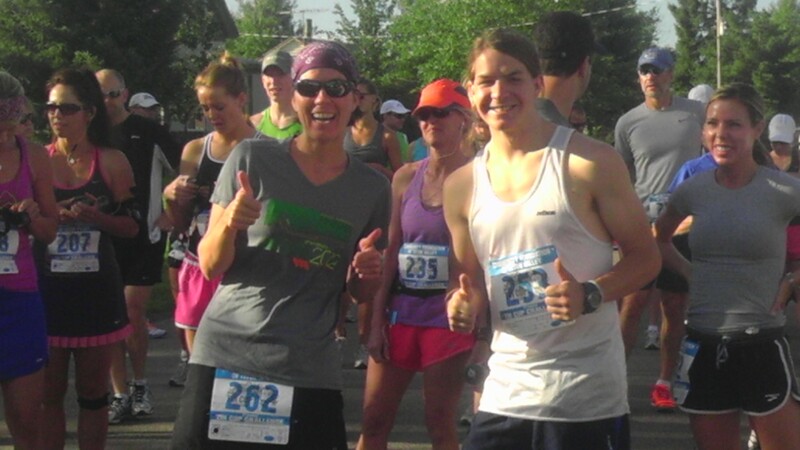 They had on singlets that sported, Skinny Skis, Peaked Sports, and Teton Trail Runner’s. 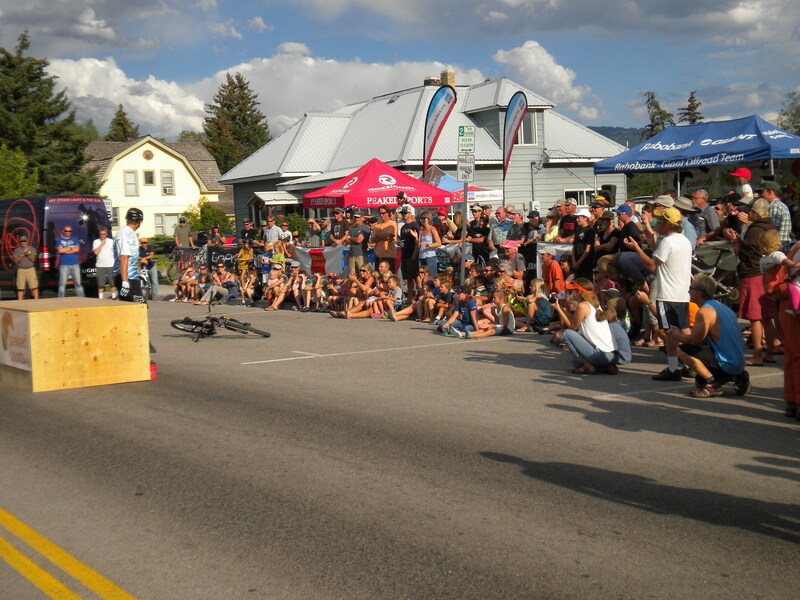 The female overall winner was Alyssa Larsen. 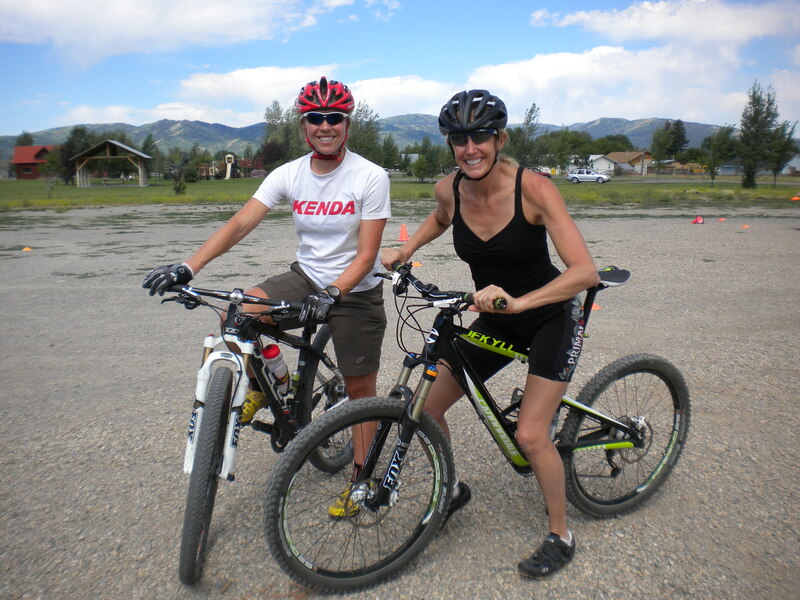 She, and her husband Kristian, formed a group that meets on Tuesday evenings and runs trails. http://www.tetontrailrunners.com. She is a talented runner. Many in the group are, but many are just there to have a good time at trotting down a trail. The valley is already at 6,500 feet so you know my Californian lungs and heart have been on fire as I try to join them on these runs. I am thankful for the introduction and the trail comrades. And their patience. 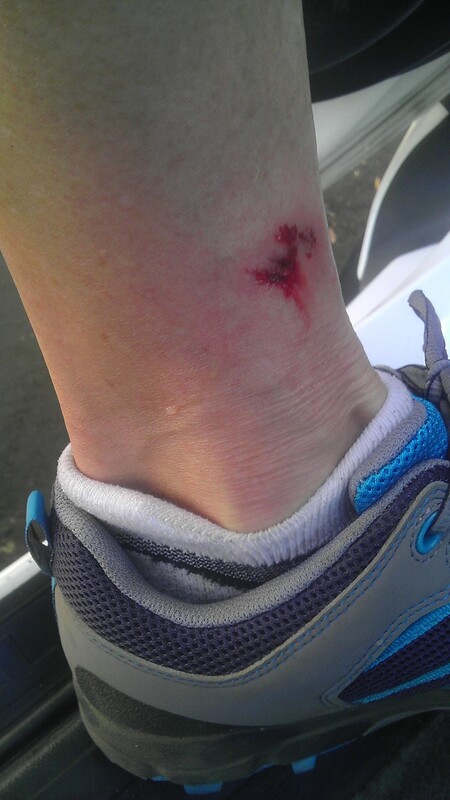 I am not a good hill runner, nor a good distance runner. I “discovered” not only that there are great running trails up Cache Creek and the steepness of Snow King, there are many trails runs within minutes of town. Just trot out the Elk Refuge or a hill near the track called Highschool Peak. Teton Trail Runners met on a trail halfway up Teton Pass called Phillips Ridge. 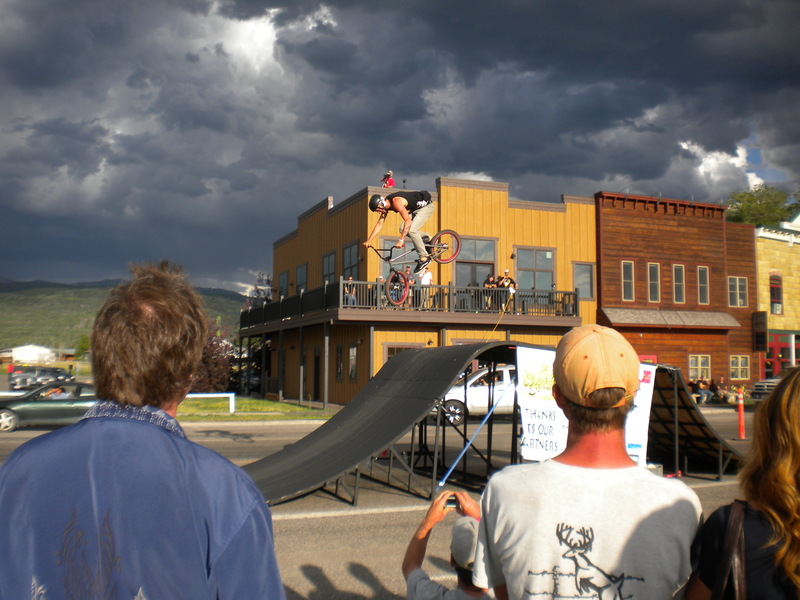 They run from the Jackson Hole Ski resort, and on a tame levy lining the Snake on the way to the town of Wilson. And they run at races all over the region. 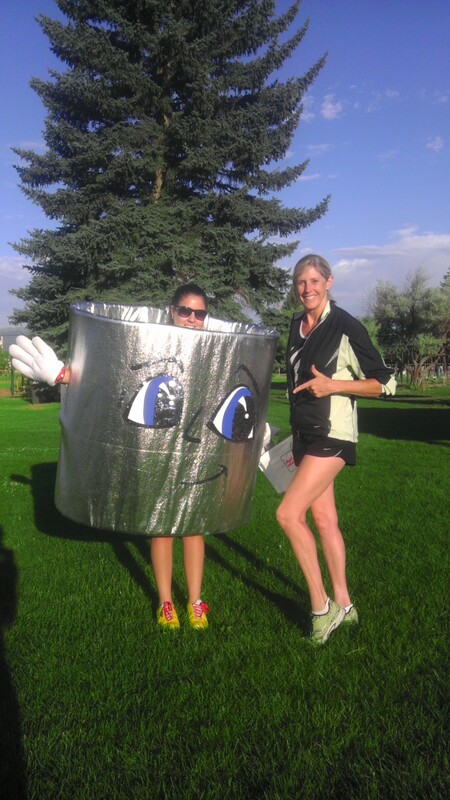 They asked me to come enjoy THE TIN CUP run with them. It was in August in a town on the other side of the pass called Driggs, Idaho. 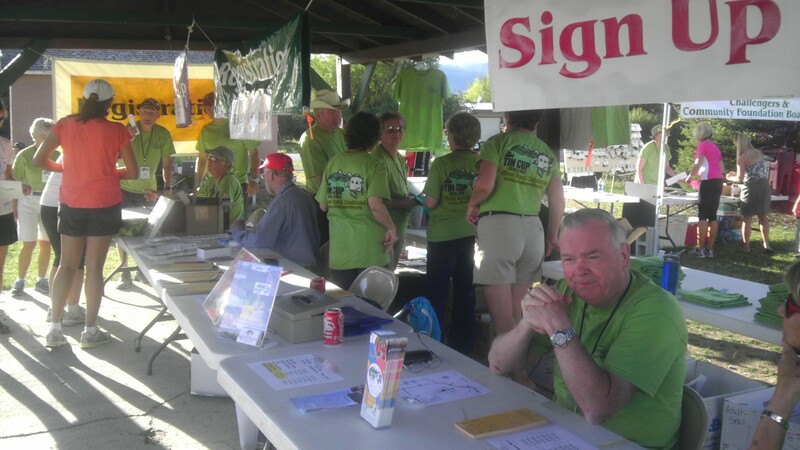 Driggs had a sign boasting population 1600. 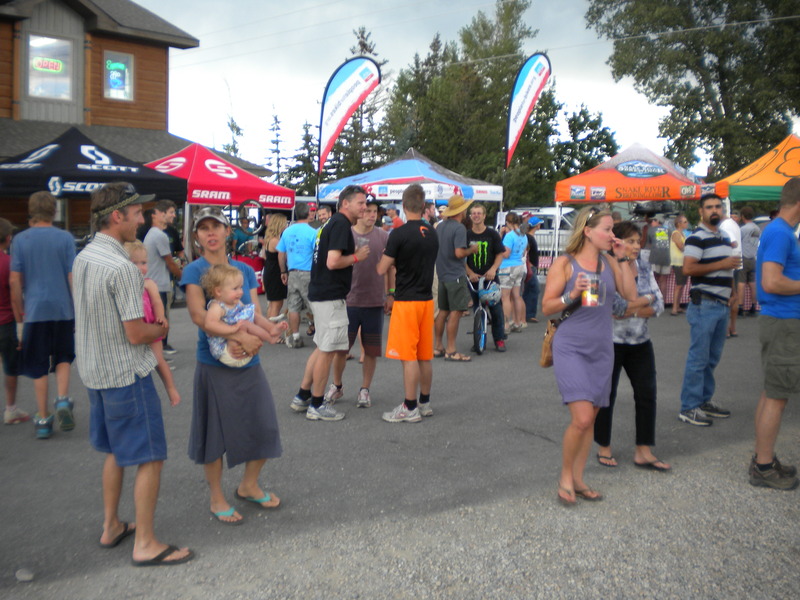 There were about 600 runners and 1000 additional spectators at this event that was a festive, outdoor, picnic style affair. 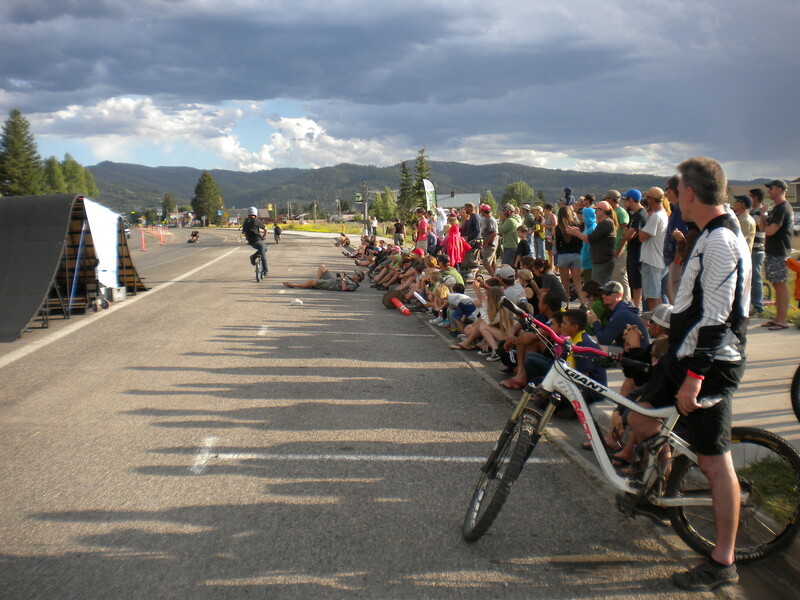 1600 meant the entire town came out for the event. Impressive. Casual. And a run well done and well supported by the community. 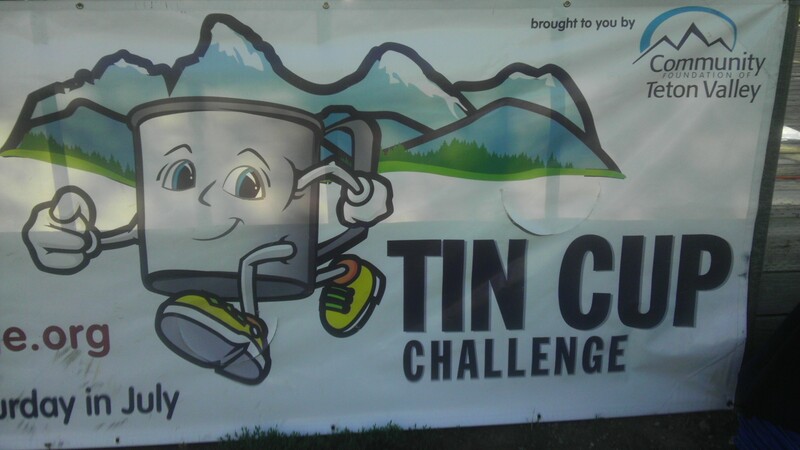 I was impressed to see chips on the bibs and an electronic mat system at the start and finish line way out here. They had brought in a timing service all the way from Salt Lake City, Utah. 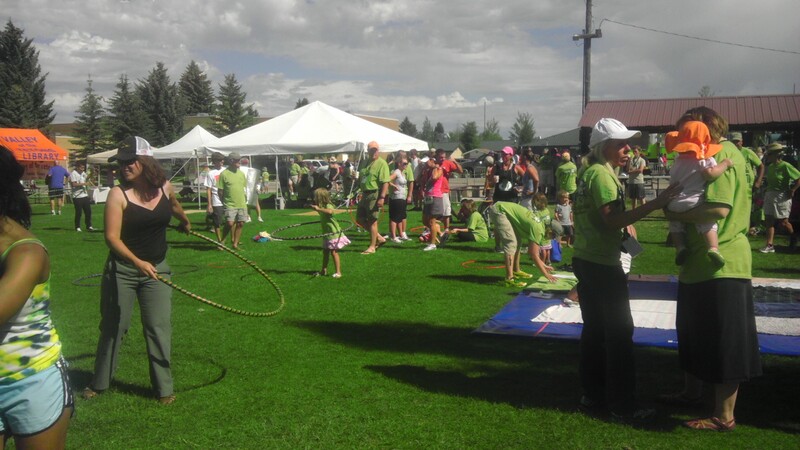 I was also impressed to see kids learning to rope cows, Nordic skiing clubs soliciting new members, and a pathways foundation helping produce funds and volunteer clean up crews to keep the bike paths in shape. I liked these people and the feel of the event. And yet, honestly, I felt …like a High School kid that just transferred into a new school in a new location. I knew no one and it didn’t feel good. Being around all these people that ‘belonged’ here and all seemed to know each other felt… lonely. Alyssa bounced up to me and thanked me for showing up, and to have fun on the run. Well, thank you. I should archive and remember to do that to someone else that may be as out of place and awkward in their new surroundings. Remember to invite. To include. In the rays of the morning, I found myself on this dry lake bed in Somewhere, Nevada. 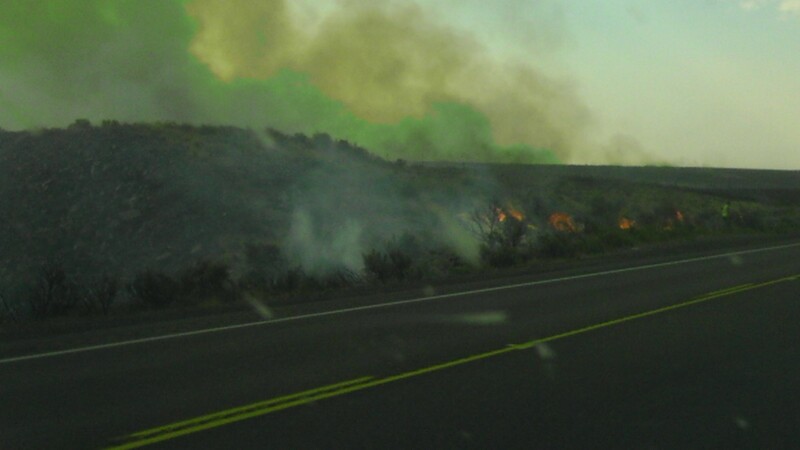 As I back tracked to a paved road and took it north, I drove right past a prairie fire. A single state highway trooper was motioning me to turn around and head back to a town called Jack Pot. In Jack Pot, Nevada, I and a few truckers waited for the fire to fan past the road and town. It was a little frightening to hope that the back fires they set would allow that rapidly advancing wall of flames to go over and around this very tiny town. That was town number one. 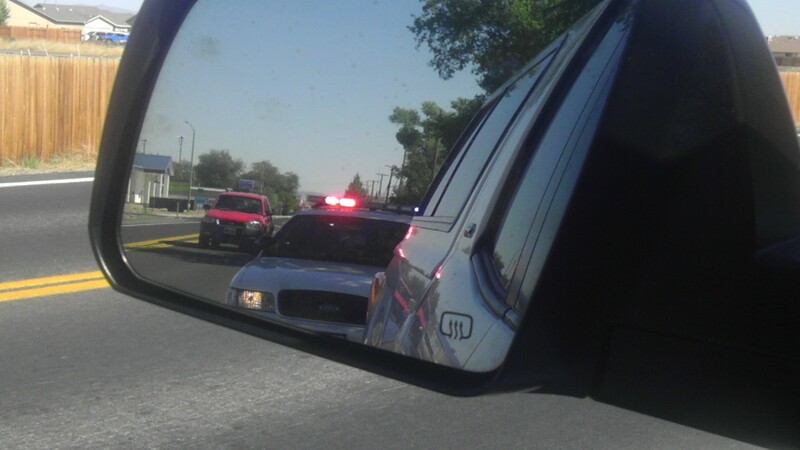 In the only other town I entered while traversing Nevada, I got the privilege of being pulled over. This officer reprimanded me for ‘speeding’ through their town at 35 mph. Their town, which I have no idea what its name was, had a city ordinance of 25 mph. “What’s your hurry anyway, Miss Women with the California plates. Wherever you are heading, I promise they are not in a hurry.” I told him, almost under my breath, that I was heading this direction to do just that…slow down. 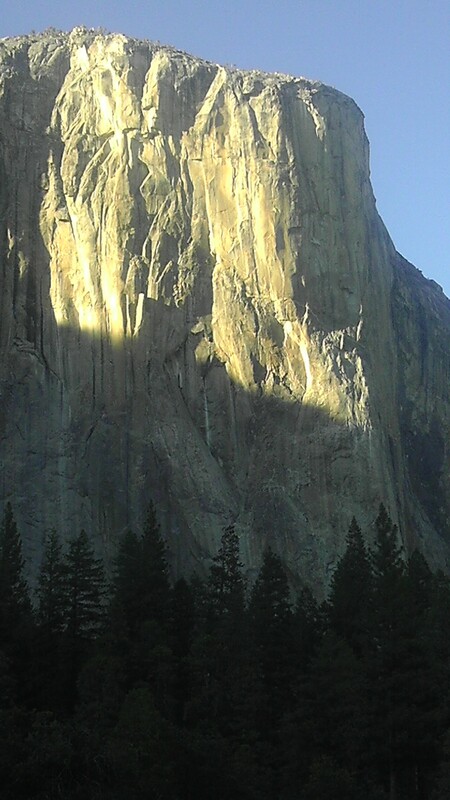 I hit the tunnel that opens to the expanse of Yosemite in the golden rays of late afternoon. It was a pretty drive as the strong yellow beams slanted through the trees. 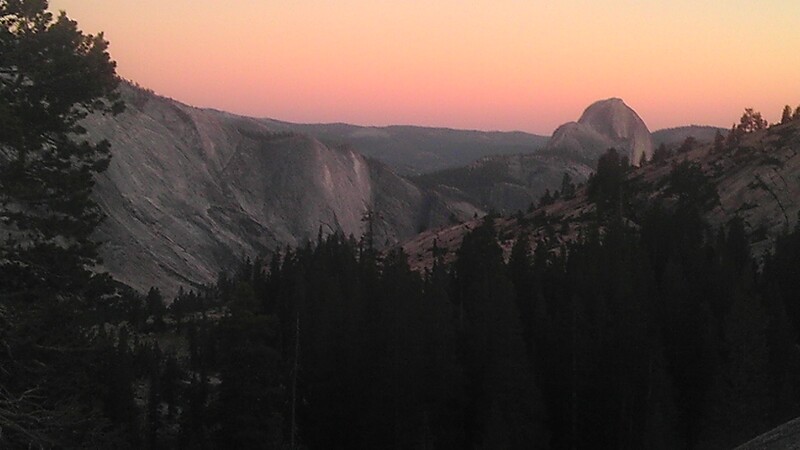 The setting sun cast huge shadows across Yosemite Valley. 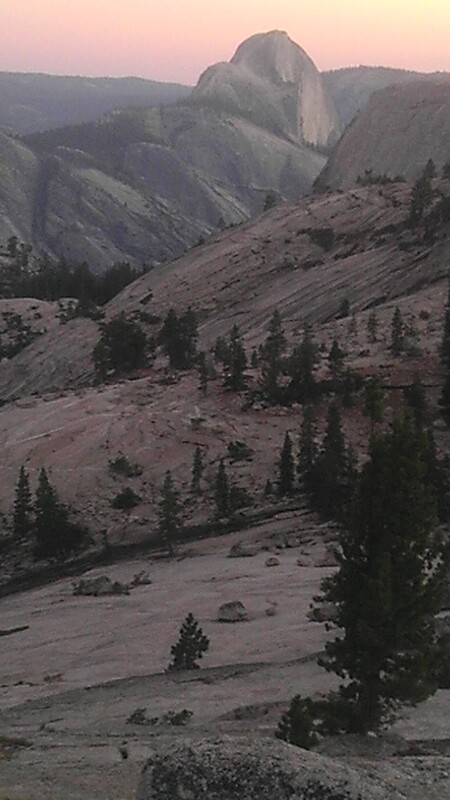 I was trying to get to Tuolumne Meadows and over the pass before it got one hundred percent dark. It seemed like I was the only one on this highway. Though the campground full signs were posted in the valley, few ventured on these roads at night. I would end up in Lee Vining, on Hwy 395, about midnight. I found a cell pocket and called ahead for a motel room. The voice on the other end sounded creepy and I got wigged when he asked if I was traveling alone. I decided to check the town out and its motels in person before making a committed reservation over the phone. Lee Vining ended up being a tiny, picturesquely remote roadside town with a pizza and ribs restaurant and a few motels. Unfortunately, when I got to Lee Vining, the few motels blinked red “NO VACANCY”s. It was past midnight. I had been up for 48 hours. I was in dire need of a few hours of sleep. 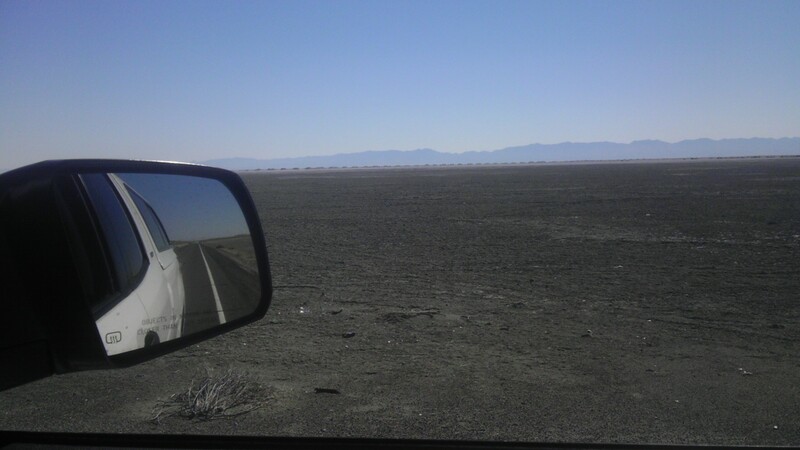 My intent had been to slice across Nevada on roads billed as the loneliest roads in America, about four hundred miles that had only two towns, USA’s mini Australian Outback. It was disappointing to find myself traveling through it at night. I had envisioned taking in the vast, desolate landscape from the security of my sturdy truck after a restful night and 8 hours sleep. Not to be. The town lights disappear and a few stars popped out. But only a few. I was impressed with how dark it was. Strange how a sense of adventure doesn’t feel so adventurous when you can’t see beyond the reaches of your headlights., when nothing known and familiar is out there. Strange what your imagination conjures up when you can’t see .No, not strange. Scary. I was afraid. I was too tired to drive, but too fearful of being out here in the dark to sleep in my truck. Every time I pulled over and tried, I just couldn’t be that vulnerable. I’d start the truck within minutes and drive on. It was too real how truly alone I was. There was no longer any cell service. I saw one set of lights that took 30 minutes to finally go by me right when I first left Lee Vining. That’s how flat and vast this area is. Those two beady eyes were to be the only other vehicle I met on this ‘loneliest road. Did I sublimely do this to myself? Get myself out here in the middle of nowhere, in the middle of the night as my ghost of Christmas Present? Stark. I was one hundred percent alone. I was one hundred percent in the dark. A dark, dark, dark. And I was one hundred percent overwhelmed by my self- inflicted situation. I had no choice , but to spar with my fears. What was I afraid of anyway? Something or somebody lurking out there that could pounce on me? No. I was afraid of the BIG BAD UNKNOWN. I was afraid of what I couldn’t see. I was going down a road I had never been down before. I didn’t know what lie ahead. And that was terrifying. I had no other choice, but to just be brave and rely on the confidence that I could handle the unknown. This was harshly that same rawness I felt forming in my life right now. Buyer beware. If you think there is greener grass on the other side of a broken marriage you are in for some tough alone times first. You have to be willing to survive parched desert first. I was traveling down a road, alone. I was traveling down a road I had never been on before and I definitely knew not what lie ahead. Again…that theme. You will have to be brave, Caren. Just gonna have to be brave. Then the pavement I was on turned to dirt and bluntly ended. I was on some sort of salt crusted, dry lake bed. It was the A.M. hours and I was in the middle of nowhere. And now, once again, I was without GPS service and I was lost. I had no choice, but to wait till the sun rose. I locked my doors and curled in a ball in the driver’s seat. There was no other room left in the over packed truck. The handle bars of my bike poked the back of my head. A picture of my two kids playing in a snow storm as teens stared me right in the eye from the seat belted stack. I switched off the doom light and black, as black as a cave, engulfed me. Adventure on. 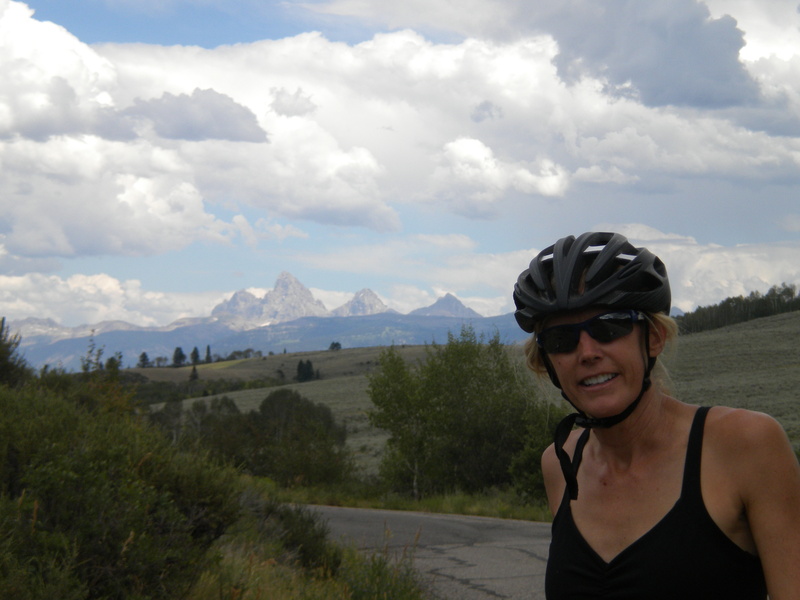 This time I took the most indirect route to Jackson, Wyoming, spontaneously and purposely. I headed out of Los Angeles over the Grapevine, dumping into the San Joaquin Valley. The outside temperature was a searing 108 degrees. Baking Bakersfield and Fresno went by on Hwy 99. Onto Hwy 40 and after Oakhurst, I pulled off and up through the pines and headed to Bass Lake, California. I rolled down the windows and there was that spicy, sweet smell of this area’s particular pines. The lake came in view and the inviting sounds of jet skis and boats cracked a smile in my heart I hoped it could. 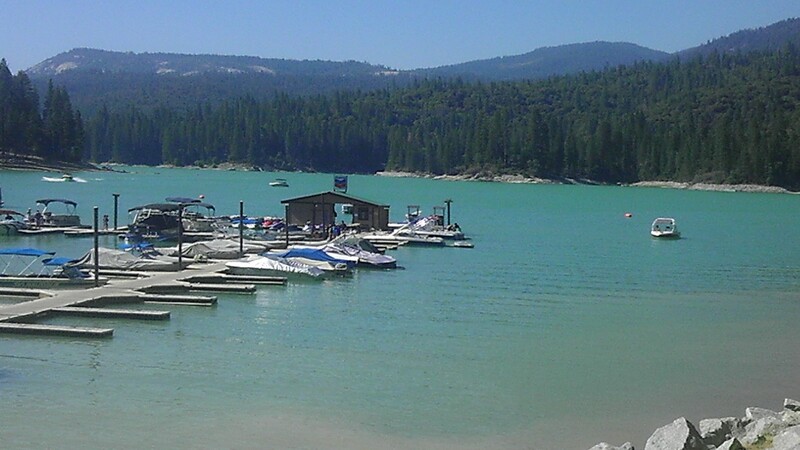 Bass lake had been a great stomping place for me. I worked for Yosemite Sierra Summer Camp the four years I was in college. The camp was intimate and isolated, but attached to the lake for skiing. 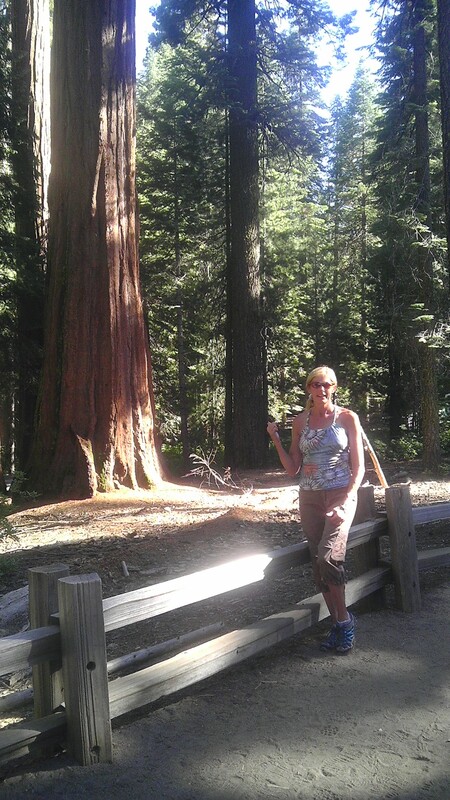 Yosemite Sierra Summer Camp took cheery, chattering busloads of campers to climbing and hiking in Yosemite. I was one of their term camp counselors that taught water skiing and climbing, and guided backpacking trips and hikes to the top of Half Dome. The summers were organized and very focused on the joys and experiences of the campers, but we counselors were the better benefactors from solid summers spent there. It was a Christian camp dedicated to providing super trips that taught kids about themselves, relationships, and who God could be in their lives. I was so impressed with how this impacted and changed lives through just being outdoors. I minored in Camp and Recreation Administration. I hoped for the opportunity to use outdoors as a means to affect lives. My husband and I had even taken positions one summer at running the kitchen and camp maintenance when our kids were toddlers. That is how much I loved this camp. And the outdoors. Someone told me as I struggled to find direction from the divorce to go back to where I think I first lost the sock. So ponder… I never lost my socks when I was in the outdoors. I was heading back to that spot. Camp was in session so I wasn’t sure if I wanted to interrupt. I pulled into a marina and went for a short trail run. It was hot even at this altitude. Coming back very sweaty, I plunged into the lake, luckily, feet first. I was met with a surprising jar and a searing pain. What appeared to be emerald and deep water was actually shallow. I had hit a rock only a few inches below the surface. It made me mad at how stupid I was to misjudge the depth and not check first what the consequences of taking such a plunge would be. The gash could have used stiches. I refused to baby it. I deserved the scar it would leave. Stupid, Caren, to plunge without knowing what lie underneath. It was a great parallel of the reality of the same stupidity I had to face in the consequences of plunging into a relationship while still married. It looked so cool and refreshing. 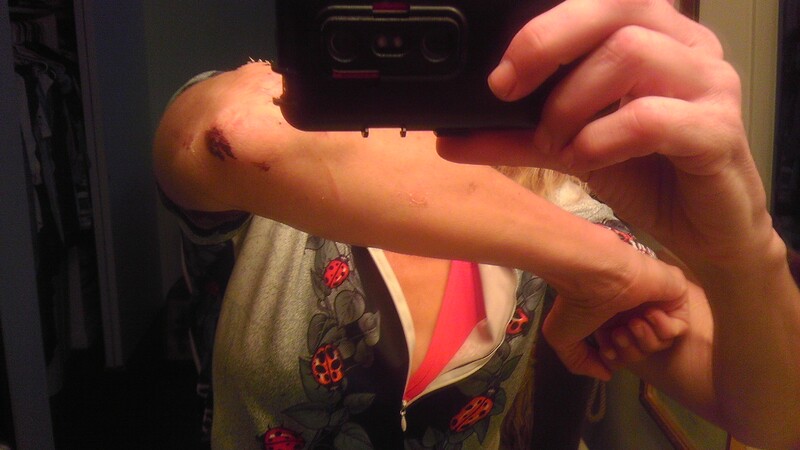 The pain from both my new injury and the ones the relationship plunge had caused racked my body. Tears rolled. Mad tears. Hurt tears. How could I have been so stupid? Needy. Wreckless. I rocked and writhed, wet and muddy on the dirt path. 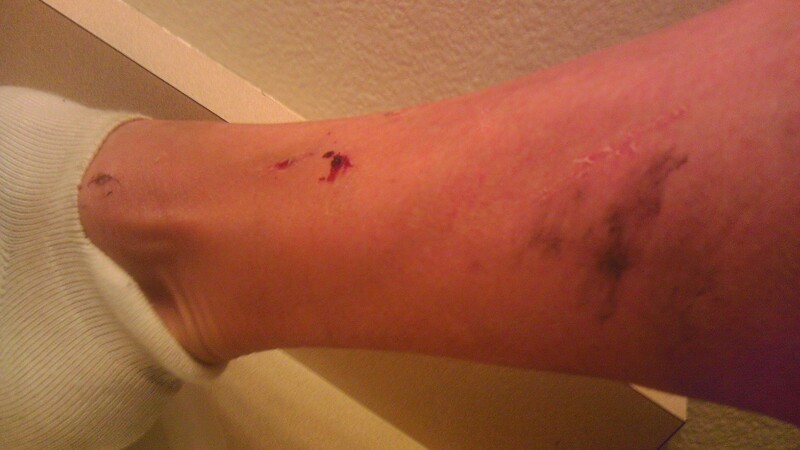 Both inflicted rightful pain I deserved. Both gashes will leave scars. I finally grappled myself together, wrapped my wound from my truck first aid kit, changed from my soiled running outfit in the bath house, and visited the camp. I was thrilled to find it unchanged. Though years had gone by, the campers bouncing by with paddles and life vests, swinging on ropes courses, and nets, they were just the same. And the camp owner’s daughter, my exact age now, was the new camp director. We high fived each other over turning fifty. And the counselors? Many were the sons and daughters of the counselors I had worked with years before. De ju vue. It is one of the best run camps around. Definitely, in my book, one of the most effective and well rounded. I didn’t stay long, but it was a detour I needed to remind myself of. Felt like I self-imposed a scene from Scrooge and Christmas Past. Felt like it reminded me that the outdoors is that powerful teaching environment. It was refreshing to know that nature, credit it God’s creation, hadn’t changed that much. Romans 1:20. “For since the creation of the world His invisible attributes are clearly seen, being understood by the things that are made….” God’s invisible attributes are seen in the things He has created. I personally cannot deny that.